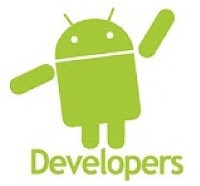 Now a days Developer are busy in developing system applications for android to provide it functionality like a Computer. One Of the Handy Android System Application Is C4droid. First Of All What Is C4droid..? 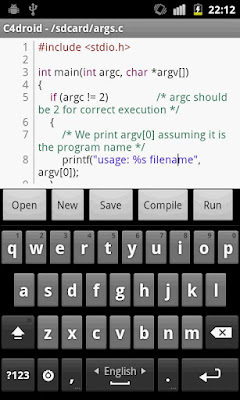 C4droid is a C/C++ compiler for Android. C4droid already has almost full C language support. Now You write your own applications on Android phone, and run them. This app uses TCC and uClibc, so it has full support of ANSI C and some support of ISO C99. STEP 1: First Of All Search "C4droid". STEP 2:Download That Application And Install It On Your Android Phone. STEP 3:Open C4droid. 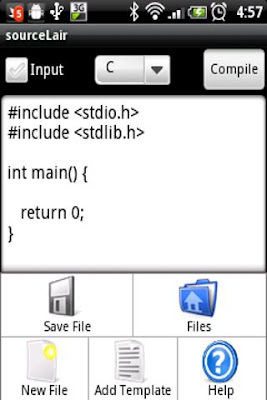 Now A Text Editor Will Appear In Front Of You..Write your C or C++ Code There. You Can Also Able To Supply Arguments For Your Program By just Leaving A blank Space Between Two Arguments. If you Don't Like C4droid then SouceLair Is another alternative to this. You Can Download Source Lair By Searching "SourceLair" On Google Play(Android Market). Source Lair Can Compile and run your C, C++, Objective-C, Fortran and Pascal programs right on your phone with their Cloud Based Compiler. If You are going to Use Source Lair To Compile And Run Your Programs,Then Remember it Needs A Internet Facility On Your Phone To Interact With Their Cloud Based Compiler Server. 9apps is the best alternate of other play store. There are huge collection of premium apps available free. This9AppsDownload Thousands of top best android apps at 9Apps app store! Play free apps for android mobile phone now. There are huge collections of gaming apps available on 9apps. I love 9apps because of these games. I download and play awesome games from there. 9apps is such a tool from where any android phone users can download all types of app. 9app features resemble to play store. This tool is far better from other tool from where user download application. This 9 Apps apk is the only store which have free only applications. all the premium and high cost applications are available to download for free. in the applications store many of the applications are infected with virus and bots. Its really amazing apps we can download any thing like 9apps games its really great. Thanks for sharing this article with us. Most of the shoppers and online games players keep 9apps in their phone to get new offers on downloading apps and downloading gaming apps for free. People do a lot of research on shopping, specially on shopping mobile apps because users get cashback and many other benefits. Now users can also get something on downloading app from a particular app store.